Just to say that I shall not be writing this blog for the foreseeable future. I post weekly pottery updates on Facebook and daily on Instagram. My work can be purchased direct from my Website or from my Etsy shop. Thankyou so much for reading my blog over the years - it has been a pleasure to read all yours and I hope to continue to do so from time to time. which I then transferred into clay. that will make them a bit special when finished. which I will learn from when making the full batch. - all bare trees and leaves. which is improving my pathetic knowledge of Geography no end. Every time I post a parcel, I look it up on a map. I now know where Durham is - it's in North Carolina! And I also know where Bradford is - it's in Rhode Island! Which is where this little lot headed off to today. Safe journey across the pond, little pots! So that's me for this month. - which I am looking forward to catching up on this weekend! August - hot or what? rather than slaving over a hot kiln! and a poor turnout of people! and I'm trying to never run out of stock for my Etsy shop. and how it's all going to fit together is quite satisfying. finished tiled pot-stands or trivets. and made some lovely pot-stands. in my Etsy shop - link in side bar. in all sorts of colour combos. but there are a few in the shop. 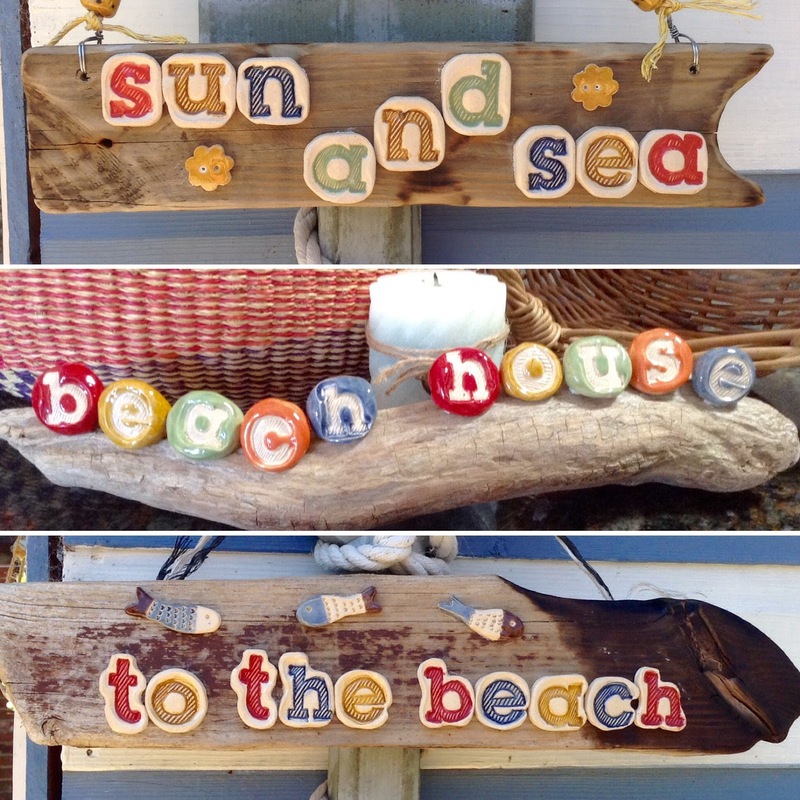 lots of driftwood and ceramic signs for summer-living! which was great fun to do! Have a happy September everyone! July - Hi and Goodbye! yes, it was worth waiting for wasn't it? I got back to the pottery raring to go. Opening the kiln - the magic has happened again!! 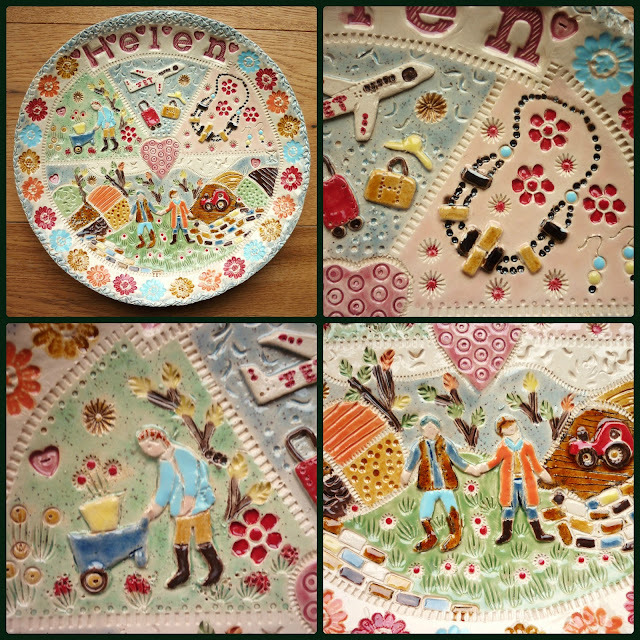 to this little patchwork plate. I was so pleased with the way it turned out. are only £10 each in my Etsy shop. and then this one did too! Note to self - Make Lots of These Next Time! (there - said the word - in July!). with my hanging pieces - think it worked. I shall still have some stock to sell! of people looking at my stuff in front of me! I hope to get over that one day! nothing for it but to bury myself in my studio and make stuff!!! 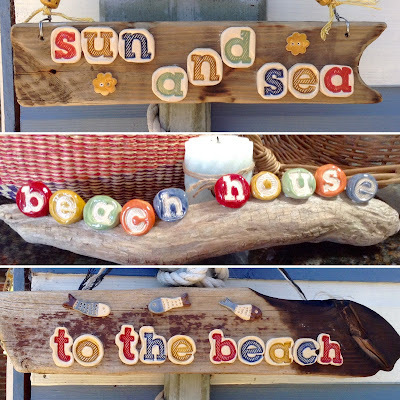 by making loads of coastal-themed things! ready for assembling with the ceramic pieces. on to driftwood to make wall vases. The green one sold within five minutes of listing in my Etsy shop! no longer linger in a corner of the studio!. with a hanger on the back. like these little Paisley tealight holders. which will come through in the weeks ahead. It wasn't all work and no play though. and he was brilliant, as usual! for which he got a First! Well done Joe! and out the other side! Phew! and sunny in the Summer months! is that it really brings home how fast time races by! and I have to say, I am beyond pleased with the results! 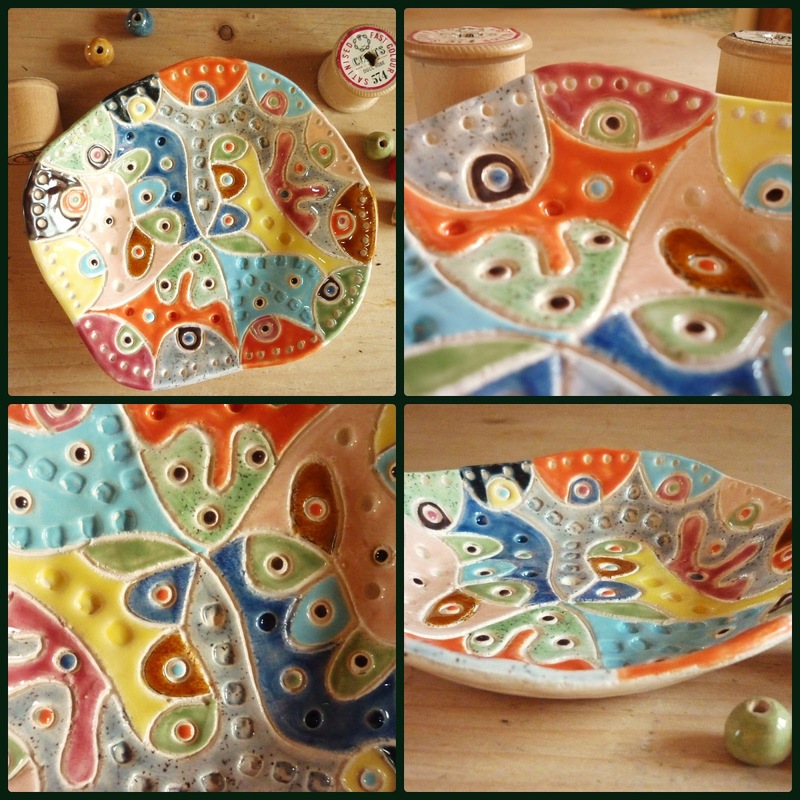 into the wet clay to create wonderful patterns. so here we have another version. Am I on drugs? I love this little Star dish! Again, a lacey one. There's the doily in the picture. with red and orange highlights to make it twinkle! so more of these coming all the time. Always different, never two the same. with rows of hearts and flowers. So delicate - so Summery! and even areas showing worn out holes. with the thread, and a little blue button separately attached. another work of art, hand-painted by me! Now all we need is SUMMER to go with it! ...... with the exception of the shed!! Have a lovely Bank Holiday weekend in the sunshine. I suddenly realised it's nearly May. My disbelief is understandable given that we're now having January's weather again! 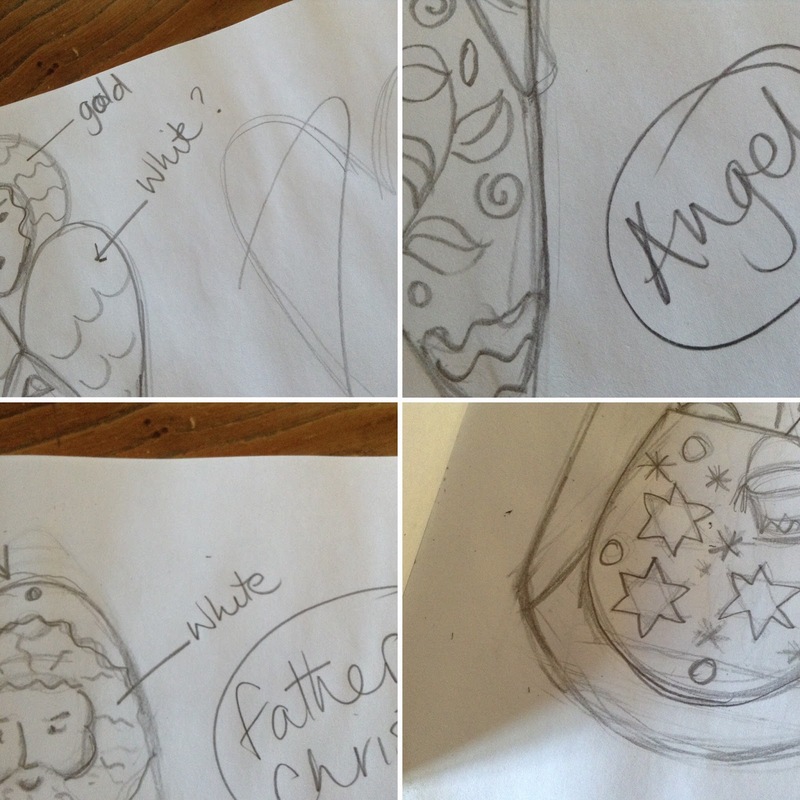 Anyway, time to take stock of what's emerged from the pottery this month. This new format I've imposed on you all is actually quite good for me and acts like a LOG in the true sense of bLOG - a personal log of what I have made and what I plan for next month. These are just a few highlights. As usual, there were little things,like these tiny cup-shaped flowers. 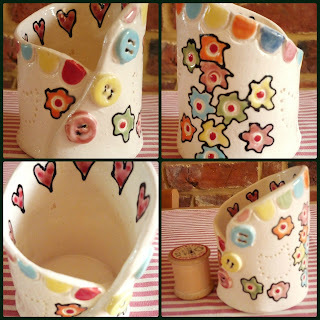 I impressed the shape into clay, cut round each one individually and shaped them into cups. To paraphrase William Morris - I don't know that they are useful, but I do believe them to be beautiful! Then, to some big pieces - this was a commission I got via Etsy, which so far is working well for me. This was made to the specifications of the client, and I really love making these extra special, meaningful things. A few more wraparound vases to replenish those sold last month. four little plates, each bearing a vintage 1930s applique quilt block design. (google it if you don't know and are interested - there are some fabulous examples out there!). Clockwise from top left, they are: 'Meadow Daisy', 'Combination Rose', 'Mexican Rose', and 'Cherry'. Here's one of the patterns from my book. And last but not least, I made a few Paisley patterned tea-light holders. I think these are really sweet, and although it's no longer winter and candle-time, (no, really, it isn't!! ), I made these in pastels so that they can be used on all those many long summer evenings when we're all dining alfresco. All these are now in my Etsy shop. Hope you all have a warm, spring-sunshiny, bank-holiday weekend. I'll now get round to all your blogs and catch up with your news. 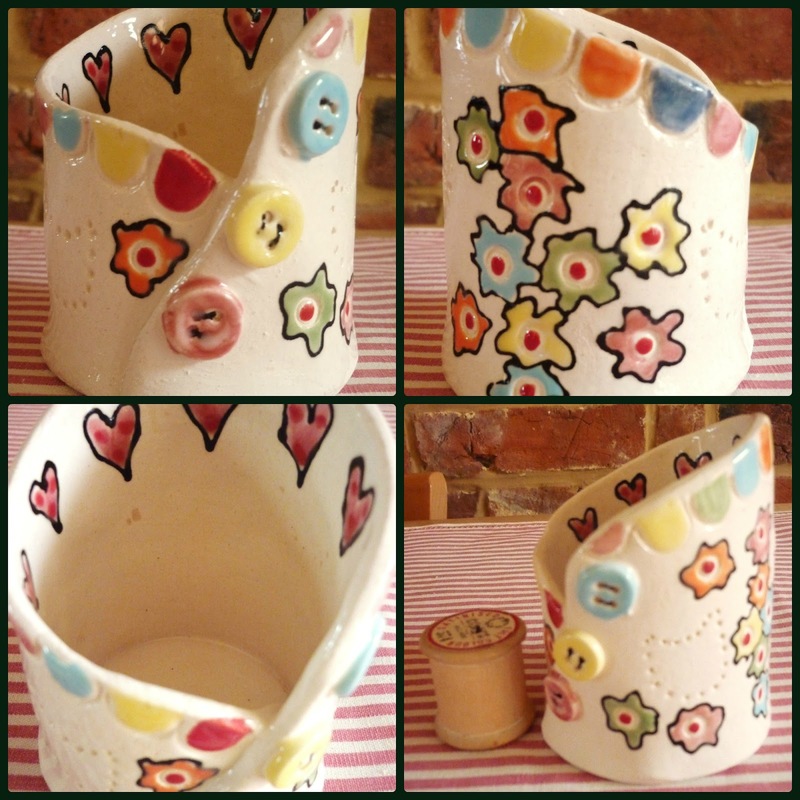 Labels: ceramic patchwork vases, ceramic personalised gifts, handmade ceramic tealight holders, handmade ceramics on Etsy. 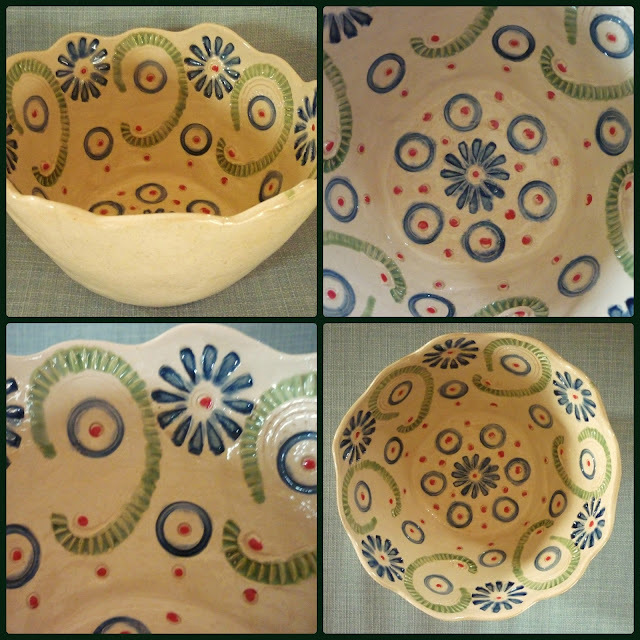 ...... oh, and a pottery, I nearly forgot! Have been mulling over how best to serve all these masters and, as far as this blog is concerned, I think I'm going to just do a monthly round-up of some of the ceramics I've been producing. For anyone really interested in the day to day workings of the pottery, I post on IG daily, and on FB weekly. So March was a busy time. Made a commissioned piece for a birthday. You've seen lots of these here before. Each one reflects the recipient's life - hobbies, interests, etc. Had a mad psychedelic phase (well, I did grow up in the Sixties!). This one's in my Etsy shop now. I varied it all as usual with some smaller bits and pieces. Some sold, some still up on Etsy. Had fun with a new, deeper bowl shape. Pleased with how it turned out. and put these into the Etsy shop, in packs of four. or leave it drab brown. Looking at the above, what do you think I'll decide to do?! Hope you all had a lovely Easter and are looking forward to some gorgeous Spring sunshine this weekend! 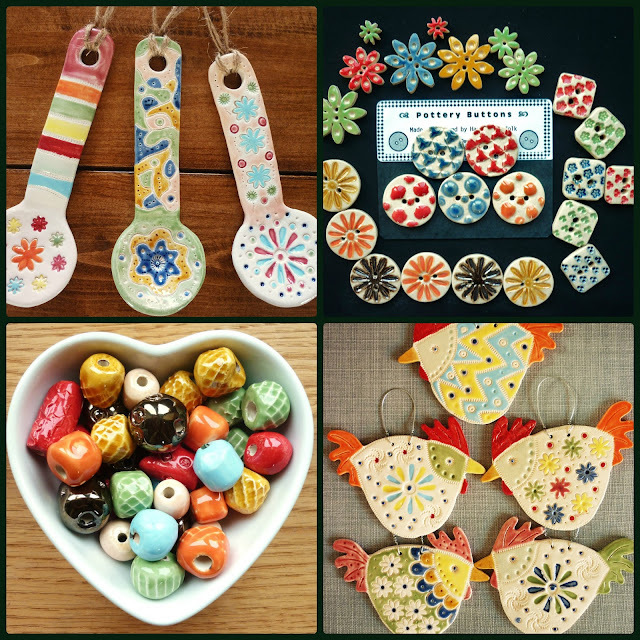 Traditional quilt blocks are the inspiration for my handmade pottery and my new range of gifts and homewares. F o l l o w . . .
For more - see website.